Tomas and Ebba, along with their two children, are enjoying a family ski vacation in the French Alps. A controlled avalanche comes perilously close to the outdoor restaurant where they are enjoying lunch. As diners run in panic, Ebba calls for Tomas to help her. Tomas, however, has grabbed his cell phone and fled. No one is harmed and the family resumes their vacation, but Ebba cannot forgive Tomas’ instinct to run and his refusal to acknowledge that he failed to protect his family. 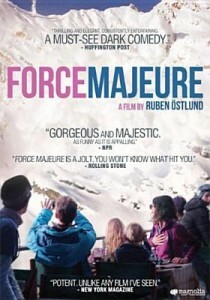 Force Majeure, a well-executed psychodrama, will have you questioning Ebba’s and Tomas’ role in the incident that caused a shift in the family’s dynamics. This entry was posted in Mary K. and tagged drama, foreign, movie on September 11, 2015 by jamiea.